Thinking should be done beforehand and afterwards–never while actually taking a photograph. Success depends on the extent of one’s general culture, on one’s set of values, one’s clarity of mind and vivacity. The thing to be feared most is the artificially contrived, the contrary to life. 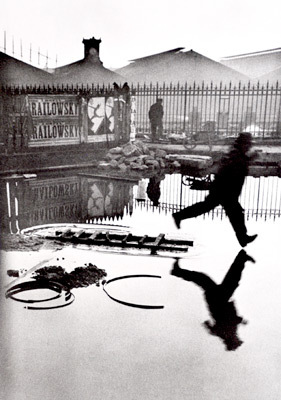 Henri Cartier-Bresson’s name has become synonymous with the “Decisive Moment” in photography in which one is able to capture the essence of an interaction or action at its peak. Cartier-Bresson has been influential to several generations of photographers as the man who elevated photojournalism to a fine art form. His use and control of composition is unmistakable. His compassion, his eye for interaction, his ability to not only capture the moment but to keep the feelings of the moment vital have been his signature. He has had three recurring artistic interests: photography, film, and painting. In 1923 he began studying painting, continuing his studies in 1927 and 1928 with Andre Lhote, the cubist painter. In 1930 he became seriously committed to photography influenced by the work of Man Ray and Eugene Atget. 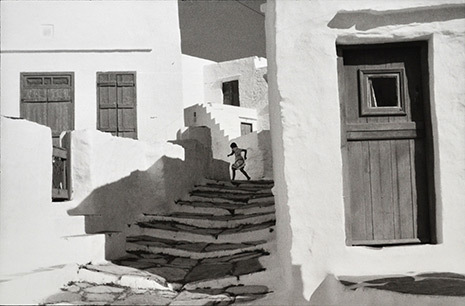 He later credited Andre Kertesz as his “poetic source”. Using the Leica enabled Bresson to work quickly and inconspicuously. He became skilled at merging into a situation, almost disappearing from the attention of his subjects. He called his camera an extension of his eye, one through which he could perceive and organize a scene with the speed of vision itself, capturing the mystery, the humor, the universality of the people and events that passed before him. In 1937 he began doing picture stories for magazines and newspapers and later, with Robert Capa, David Seymour, and others, founded the Magnum picture agency, a group of photo-journalists who organized themselves to deal with museums and newspapers in a more formalistic way. Cartier-Bresson’s finest photographs go beyond simple street reportage to touch some underlying, though usually hard-to-verbalize, reality that touches upon the essence of the subject. His photographs celebrate life in all circumstances.